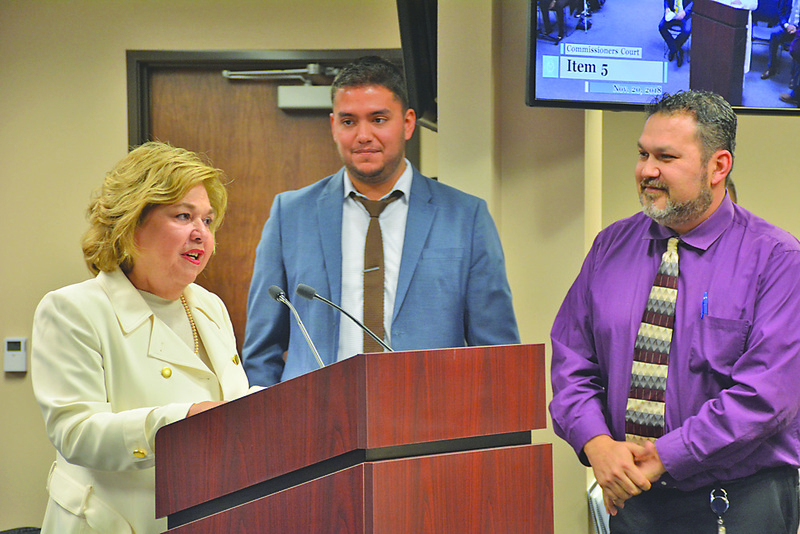 Courtesy photo County Judge Chief of Staff Yolanda Chapa, Administrative Assistant Nestor Lopez and Economic Development Director Michael Leo present the STED grant awardees and evaluation committee at Tuesday's county commission meeting. The program is similar to others offered by larger municipalities, such as Mission’s Red Ruby Venture. It is essentially a competition between business owners who applied, similar to ABC’s “Shark Tank,” and they must complete a series of tasks before they make their final pitch to a five-member evaluation committee. Those tasks included attending trainings and creating a business plan. The county received 43 applications and 21 were selected to participate. Many of the participants expressed appreciation of the resources provided, finding value in the process itself, Economic Development Director Michael Leo said in a press release. “Even those that were not awarded grants benefited from the program’s training component because they now have a better sense of what it takes to run a successful business and the economic factors that affect commerce,” Leo said. The participants were given 10 minutes to present their business ideas to a panel of independent judges comprised of academic and public-sector business experts from throughout the county. This year the panelists were Lower Rio Grande Valley Development Council Economic Development Director Terrie Salinas, University of Texas Rio Grande Valley Professor Marco Garza, UT-RGV Director of the Rio Grande Valley Texas Rural Cooperative Center Collin Cain, RGV Partnership President Sergio Contreras, and Rio South Texas Economic Council Executive Director Matt Ruszczak. The committee awarded $20,000 to four businesses: Reybotics, Green Thumb Nursery, Cappadona Ranch, Ashley Nicole Boutique, and Hernandez Barns. Funding for the STED program came from the Texas Comptroller’s Office and was designated for economic development and literacy programs.